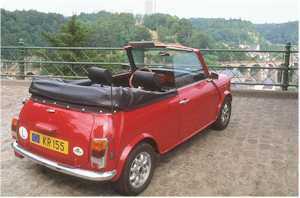 ABOVE: A vintage cabriolet on a corniche road in Luxembourg. INSET BELOW: Minicars in Montmarte, Parisian parking. Car travel in Europe can be a joy or a nightmare, depending on where and when you drive. During August, when countless millions of Europeans pack up their family cars and drive to the beaches or mountains, traffic jams can rob even the most scenic European touring routes of their charm. And at any time of year, driving in a major city like London, Paris, or Rome can be nerve-wracking (or at least unpleasant) to the foreign tourist. Spring and fall are the best times for a motoring vacation in Northern and Central Europe. In Southern Europe, winter can also be pleasant if you avoid the Christmas break. If your vacation is tied to the school calendar, try visiting in June, before the summer season reaches its peak. Many tourists, especially those from North America, make the mistake of planning car itineraries built around Europe's largest cities. They end up having to cope with nerve-wracking traffic, scarce parking, and unfamiliar regulations--all while trying to catch a glimpse of the sights through a mass of cars, motorscooters, bikes, and tour buses. Take the train between major cities. Rent cars for local or regional excursions, or for legs of your trip (e.g., Paris to the Riviera) where you want to stop and enjoy sights along the way. Visit a country like Denmark, Norway, or Sweden where even the largest cities are relatively car-friendly and you can leave town for driving excursions with a minimum of hassle. ABOVE: The Peugeot Traveller van on a European highway. Residents of countries outside the U.S. can save money with short-term tourist leases from Peugeot. Comparison shop. Check prices at European brokers that specialize in leisure rentals and short-term leasing programs. Check each company's age restrictions if you're under 25 or over 65, and see "Lease for longer trips" below. Plan carefully. Rent a car for only as long as you'll need it, to avoid early-return penalties. If you're on a budget, avoid drop-off charges by planning a circular itinerary. Book ahead. If you live outside Europe, you're likely to get a better deal by making arrangements from abroad. Lease for longer trips. A short-term car lease can save money on rentals of 21 days or more. Such "buy back" or "purchase-repurchase" leases are especially useful for students and senior citizens, since age restrictions are minimal. Buy a pass. A Rail 'n Drive Pass combines the speed and comfort of train travel with the convenience of a vehicle for local excursions. Think small. Fuel is expensive in Europe, streets are narrow in many cities, and small cars are easier to park than large ones. Unless you need a large car or van, stick with a small to midsize car. Important note: If you're picking up a car outside the European Union, you may encounter bureaucratic hassles if you later decide to drop the car off in an EU country. To avoid potential problems, ask for a car that's regisftered in the EU if you plan to drive there. Prepare at home. European regulations, driving customs, and road signs can be confusing to foreigners, so use the information resources below to learn the basics ahead of time. Be alert. If you're from North America, forget about turning on the cruise control and floating along in the left lane while listening to Santana and slurping coffee from your MegaMug. You could have a panic attack when a BMW comes tearing up behind you, left flasher blinking, at 250 km/h (156 mph) or faster. And if you've never had to enter or exit a traffic circle (a.k.a. rotary or roundabout) in heavy traffic, get ready for a new experience--especially if local laws give priority to traffic coming from the right. Carry an International Driving Permit. This passport-like document (sometimes called an International Driver's License) is a translation of your home license. It's required in some countries and optional in others, but it's well worth having to avoid problems if you're stopped by the police or want to rent a car in a foreign country. See our International Driving Permit article. ABOVE: The Peugeot Partner is a popular crossover vehicle in Europe. Do you need liability insurance in Europe? Should you pay extra for a Collision Damage Waiver, or can you rely on your credit card's free coverage? This Europe for Visitors article has the answers. The interface may be more confusing than a Parisian roundabout, but be patient--and scroll down for links to pages on traffic signs. Icarehireinsurance has put together an infographic that shows parking signs and markings. The page also discusses parking laws and etiquette in several Western European countries. Brian Lucas describes his informative and entertaining article as "an attempt to list which side of the road people drive on around the world, and to find some reasons why." 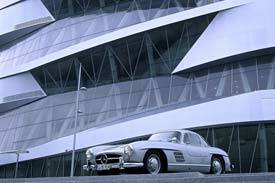 ABOVE: A classic Mercedes 300SL gullwing sports car outside the Mercedes-Benz Museum in Stuttgart, Germany. Jeff Steiner, an American resident of Strasbourg, wrote these pages for Americans in France. Read our articles about car museums and factory tours, a high-speed "race taxi," a self-drive "Trabi Safari" tour in Dresden or Berlin, and more. If you can't read the German text, try The Autobahn, from Brian's Guide to Getting Around Germany, and Hyde Flippo's Autobahn articles from The German Way and More. See what facilities are available at the 338 gas stations, 382 service areas, and 51 hotels on Germany's Autobahn network. DeTraci Regula's article is at Tripsavvy.com. Use the journey planner to design an itinerary or check traffic conditions at the official Italian motorway site, where you'll also find a handful of articles in English. Joseph F. Lomax wrote this article for InItaly.com. Learn basic rules, regulations, and other facts from Portugal-info.net. Most of this advice from Andalucia.com is applicable to Spain as a whole. This article is from our Switzerland for Visitors subsite. The country's national tourist office tells everything you need to know before hitting the road in Britain. 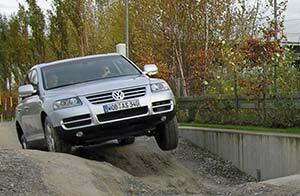 ABOVE: You can drive a VW Touareg on the off-road course at Volkswagen's Autostadt in Wolfsburg, Germany. Use the "Driving Directions" form to plan your trip, or request an online map from the ViaMichelin database. Renault has been in the tourist car-lease business since 1954. It offers a full range of vehicles, from subcompacts like the Dacia and Clio to the Espace 7-seat luxury crossover and the Trafic 9-seat van. GPS is standard on all models. Peugeot is represented by our partner, Auto Europe. 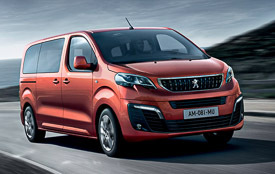 Peugeot's car models range from econocars to luxury sedans, vans, and the Peugeot Partner, which squeezes a lot of interior space into a boxy SUV-like body. Rent a car in any of 4,000+ locations, with guaranteed low rates for equivalent cars.